Today Jackson had his (slightly late) 4 month check -up and shots. He was very good for Dr. Gonzales and wasn't too bothered by the shots. This first pic is immediately after his shots. As you can tell, he handled them well. I think he looks massive in this picture. "Say, ahhh." He got cool bandaids for being a good boy. Oh - and Rob discovered that he and the doc have something in common... their comic book love. 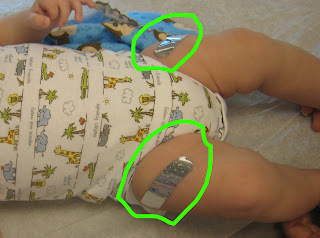 Thanks for circling the bandaids. Totally almost missed them. Now when people talk about your "chubby baby," you can say, "Statistically he's underweight proportionally...[insert whatever insult you'd like to add here}." I think he only looks massive in the first picture because the angle puts the pacifier way out of proportion.